There are a lot of figures for the rate of unemployment in Zimbabwe doing the rounds, from 95% to 5%, which is surely the biggest range you'll see for estimates of any indicator. 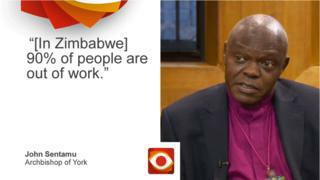 The Archbishop of York, John Sentamu, quoted a figure of 90% on the BBC's Andrew Marr Show last week. It gives the unemployment rate - that's the proportion of people over the age of 15 who are available to work but are not working - as 11.3%. That's not ridiculously high. The corresponding figure in neighbouring South Africa in 2014 was 24.9%. Zimstat was supposed to be conducting another survey this year but "resource constraints" prevented that from happening. They now hope to conduct another one in 2018. At the other end of the scale look at this article from Forbes Magazine in March this year. The headline reads: "Congratulations To Robert Mugabe - Zimbabwe's Unemployment Rate Now 95%." But the New York Times is clear that the figure it is citing is not the unemployment rate, it's the proportion of people in the country who are working in the informal economy. It also comes from Zimstat's labour force survey from 2014. It is an important metric and it's extraordinarily high, but it's not the unemployment rate. The 90% estimate comes from the Zimbabwe Congress of Trade Unions - speaking after that estimate was made, opposition leader Morgan Tsvangirai said that President Mugabe had turned the country into a nation of street vendors. But are street vendors not employed? They can't be if you are estimating a 90% unemployment rate. "The challenge for Zimbabwe is not the quantum of employment but the quality of employment," the ILO told Reality Check , adding that most people would still count as employed under the new standards, but that "the majority are employed in the informal economy, characterised by low wages, poor working conditions, little or no social security and representation."